If you understood how Tolkien drew great inspiration from his profoundly Catholic approach to life, you would then certainly see the Eucharistic overtones in this food baked by the immortal Elves, literally the “bread of angels”. By his own admission, Tolkien once wrote, “The Lord of the Rings is of course a fundamentally religious and Catholic work, unconsciously so at first, but consciously in the revision.” In fact, two of the great loves in the hidden world of Tolkien's imagination were the Eucharist and Our Lady, - upon which all “perception of beauty both in majesty and simplicity is founded.” By way of encouraging his son, he once wrote: “Out of the darkness of my life, so much frustrated, I put before you the one great thing to love on earth: the Blessed Sacrament ... There you will find romance, glory, honour, fidelity, and the true way of all your loves upon earth ... which every man's heart desires”. 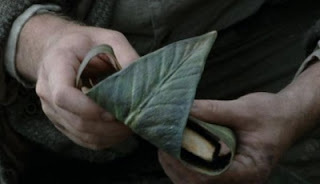 Just as Tolkien’s lembas points to the past in alluding to the Eucharist, today’s first reading from the Old Testament is a beautiful foreshadowing of the Blessed Sacrament. The scene begins with the story of Elijah fleeing into the wilderness of Judah after having fled from the clutches of Ahab, King of Israel, and his queen Jezebel, who was out to wreak revenge against Elijah for having slaughtered her pagan prophets. Now in the desert, a landscape that reflects his inner struggles, Elijah is tired and is at the point of despair. Under the broom tree, he pleads for God to take his miserable life. It is the prayer of so many of us, who have striven for the good, defended the truth, and remained faithful to God in the face of adversity, and yet find ourselves standing alone, friendless, and apparently without any hope of success in our efforts. And then the angel miraculously appeared and touched him whilst saying, “Get up and eat.” And when he looked up, he saw laid before him, a scone baked on hot stones and a jar of water. Indeed, out of the darkness of his life, in the midst of frustration, and at the moment when all seemed lost, God provided him with food, bread of the angels. Contrary to popular perception, viaticum, the Eucharist is considered to be the sacrament that is proper to the dying Christian. A popular misconception is to place the sacrament of Anointing of the Sick in this role. The reason why viaticum, or the Last Communion is regarded as the final sacrament is because it is the completion and crown of Christian life on this earth, signifying that the Christian follows the Lord to eternal glory and the banquet of the heavenly kingdom. Therefore, every soul who struggles with loneliness, alienation, setbacks, failure, crisis, disappointment, and depression needs this waybread for our journey. And the journey is never easy. It is often a long trek, sometimes through the bleakest of landscapes, towards the promised land, our Heavenly homeland. Sometimes we give way to the longing for the comforts of culture’s captivity and drown in the world’s materialistic allures. Sometimes we yield to the temptation to sit beneath the broom tree of despair and wish for death. But today’s readings remind us that even in our weakest moments, even in our darkest hour, even when we stumble and grumble, even when we sometimes lose sight of the goal, God does not forsake us. Christ continues to feed us with this divine food, giving strength to endure. It is the food that will serve us “when all else fails.” And so we do not lay down to die; we walk on, from exile toward home, from shadows and appearances to beholding God face to face.